A couple of Saturdays ago we made the trip down to West Kilbride for the launch party of the new studio for Old Maiden Aunt. Glossing over my public transport problems, suffice it to say that Jonathan was the hero of the hour and gave me a run down in the car so I could join in for at least the last wee while. Even though he was in the middle of, and dressed for, moving furniture, he kindly offered to take me. This picture shows a selection of Lilith's yarns on display, although many of her products were already packaged up for the grand trip to Knit Nation, where the stall seems to have gone down a storm. I also really loved the fabric Old Maiden Aunt bunting in those great co-ordinating fabrics. The bitterbug was a special purchase because they way the ties were done during the dyeing process, little flecks of yellow have remained on the yarn in certain places- I love that about it! I hope those of you who went to Knit Nation enjoyed yourself and have time to have a breather and recover now. It was lovely to see you at the studio warming. 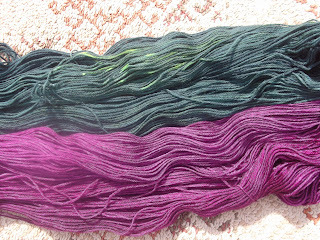 Knit Nation was great and Lilith's yarns went down really well. 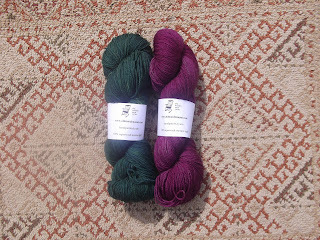 I was so excited to meet the genius behind Old Maiden Aunt yarns.